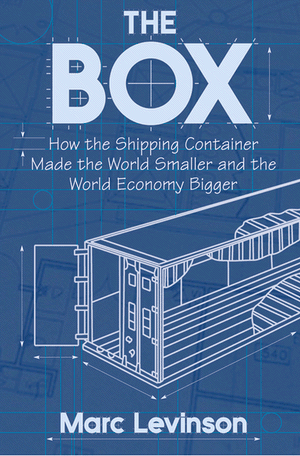 I recently read The Box: How the Shipping Container Made the World Smaller and the World Economy Bigger and I wanted to say a few words about the book. Most people are familiar with the shipping container, that big steel box that you see on ships, trains and trucks everywhere. This book is the story of the humble container, from its humble beginnings in the 1950s through its transformation of the shipping industry in the 1970s, to today. The Box takes you through all that, in a very readable and interesting way. The author, Mark Levinson , is an economist and it is evident that he understands the shipping economy very well. I enjoyed reading the book and I learned a lot about the container and how it came to be so ubiquitous. Did you know that an American truck company owner, Malcom McLean, is often called the father of containerization? He owned a large truck company and saw an opportunity to improve how items were shipped. At the time, cargo was sent over the seas in "break bulk" ships. Items were sent to ports in trucks, unloaded, then custom-packed into ships' holds by longshoremen. At the other side of the ocean, the reverse was done. The unpacking and repacking was very time-consuming and therefore expensive, and Malcom saw an opportunity to avoid that work. He did not invent the container but he was the catalyst of the container revolution. He founded Sea-Land Service (now Horizon Lines) and grew to prominence during the Vietnam War delivering containers to the U.S. military. The book focuses quite heavily on ocean shipping. Railways are mentioned a number of times, but they were late to the containerization game and do not receive a lot of attention in this book. The first half of the book deals with the rise of the container and the latter half details how containerization transformed ports and shipping in general. The container can be held responsible for the rise of previously unknown ports like Oakland, Felixstowe, Rotterdam as well as the demise of traditional ports such as New York City, London, and San Francisco. If you are at all interested in transportation and/or shipping, I recommend The Box . PS - this infographic from CNN shows the current state of shipping in the world. It is instructive to see that the top 10 container ports in the world (by volume) are all in Asia.